I’ve been wanting to try felting for some time now, and in November a perfect opportunity came up to have a go. I was taking a “Festive Exchange” workshop with the online guild of weavers, dyers and spinners where we were making bags for each other as a seasonal present. As I don’t weave (yet!) 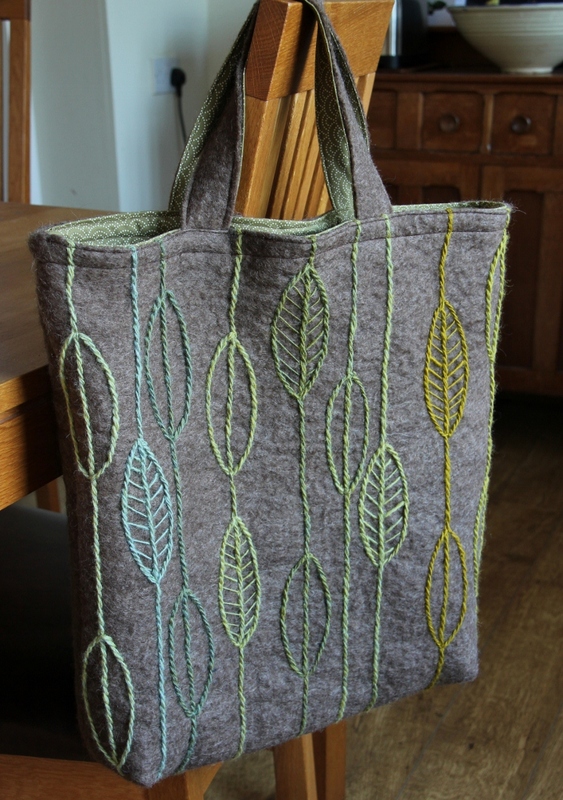 and I didn’t fancy knitting a bag, felting was the ideal choice. Felting is a great craft to try because it doesn’t require any special equipment, and if you are a spinner you are likely to have everything you need at home already: wool, soap and warm water. And once I got the hang of the basics, I really loved the whole process, felting is such a wonderfully simple and tactile task. Not very much thinking required, just using your hands to create a piece of woollen fabric in not much time at all. 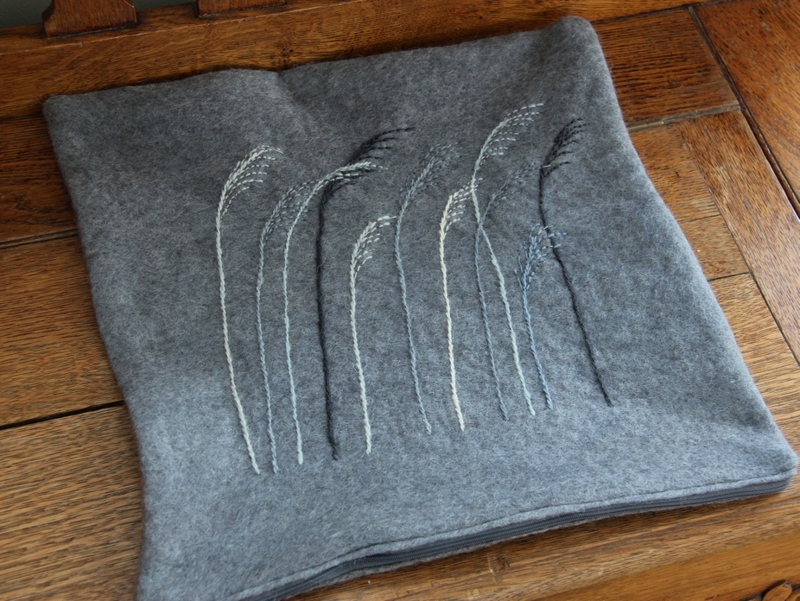 Once I had made the felt for the bag, I just wanted to keep on going and so I decided to make some felted cushion covers as Christmas presents for various members of my family. In the end I managed to make three (not in one day I must add, over a couple of weeks!). In addition to felting, I wanted to try some embroidery, so I decided to decorate the bag and the cushions with some simple patterns that would not be too difficult to sew. I spun some singles yarn in various colours mixed on my drumcader. I was particularly pleased with the greens for the bag (well I always love greens), as they were from wool dyed with home grown chamomile and woad. 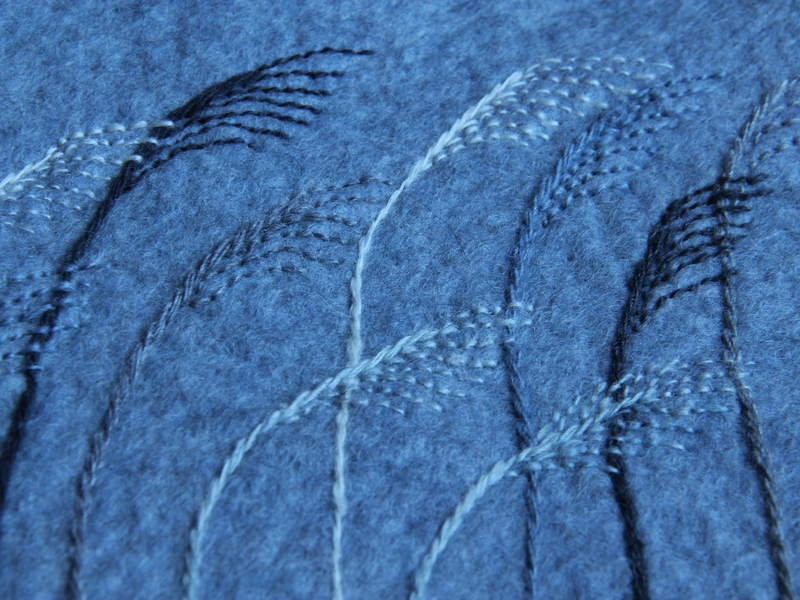 The blues and greys were mixes of naturally grey Finnsheep wool and acid dyed blues, greys and black. 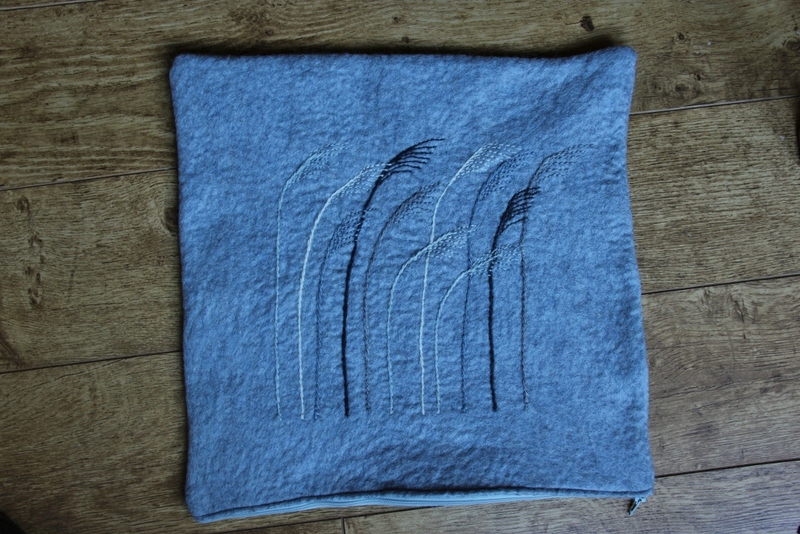 As for the patterns, I found a nice leaf motif on one of my sashiko books which I used slightly modified for the bag, and for the cushion covers I designed a simple pattern of grasses being blown in the wind. It was easy enough to sew free hand, so I didn’t have to solve the problem of how to transfer a pattern from paper to felt. I loved making these cushions, and I still have some designs in my head waiting to be used, so I am pretty certain I will be making more of them. 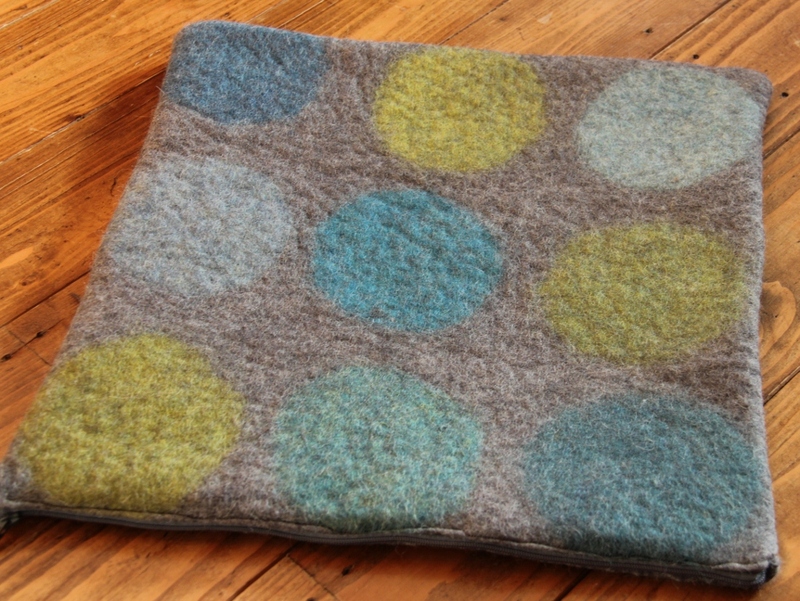 And I haven’t even made one for our own home yet so the cushion making felting frenzy might continue a bit longer. Some books recommend using soap flakes or Marseille soap for felting, but in fact any type of soap will do so I wouldn’t rush out to buy any special type for your first experiments, just use washing up liquid if you have nothing else. It might be a bit foamy but it worked perfectly OK in my first experiment. I’ve heard it said that too much foam slows down the felting process, but I didn’t have any problems with it. In the end I mainly used the liquid detergent I use for washing delicate fibers such as wool or silk. It was quite foamy too, but it kept the wool nice and soft and did not dry my hands too much. If you are making a fabric-like thin surface like I was for these pieces, you simply take take thin handfuls of carded or combed wool (straight from a commercially combed top works perfectly), and lay it down as evenly as possible on a water-proof surface. The initial size of the wool needs to be approximately third bigger than the finished size, although this will depend on the type of wool you are using so it’s definitely a good idea to make a small swatch first. Each handful needs to overlap the previous handful slightly, so that you won’t end up with holes. Once you have made one layer, you add a second layer in 90 degrees so that layers cross and the wool forms a web. Then add at least one more layer, turning 90 degrees again. I found that to make bigger pieces, it was easiest to use batts directly from my drumcarder, as it was far less fiddly than laying down small chunks of wool one handful at a time. It is very simple to felt wool: you just add warm soapy water (from a spray bottle or even just a jug) and then you just start rubbing the wool, very gently first so that it doesn’t form unwanted wrinkles. Some people recommend using a bamboo curtain or bubble wrap on which you lay your wool and then roll it around a broomstick like a Swiss roll to felt it. I tried this method, I found it pretty dull and tedious to keep rolling it, whereas I would quite happily spend time gently rubbing the wool with my hands which was much more tactile experience, and has the advantage that you see what you are doing. Once the water cools down, you need add more warm water to keep the temperature up (occasionally mopping up excess cold water with an old towel). As you rub the wool, you notice it begins to stick and eventually the individual hairs on the surface don’t move around any more. You are then ready to start really shrinking the fabric by using much more force. I would fold the piece in different ways and really knead the wool like it was bread dough. The actual way you do this doesn’t matter so much but to end up with an evenly felted piece you need to do it symmetrically. So if you roll you piece one way, and knead it around for a bit, then roll it the opposite way next. I would roll the fabric one way, knead it, open it and turn it 90 degrees, roll & knead it again, open & turn 90 degrees and so on, repeating several times. Once I ran out of energy, I would put the piece on a rinse and spin cycle on my washing machine to finish the process (but it is not necessary to do it this way, you certainly have more control if you just keep kneading the wool until it has shrank to the size you want). There are of course lots of good books about felting that give you plenty of advice and tips and inspirational pictures, but to be honest, the process is so simple that anyone willing to experiment a little bit will probably figure out the process by just practising on small sample-sized pieces first. You quickly figure out how much soap and water to use, how much force to use, etc. 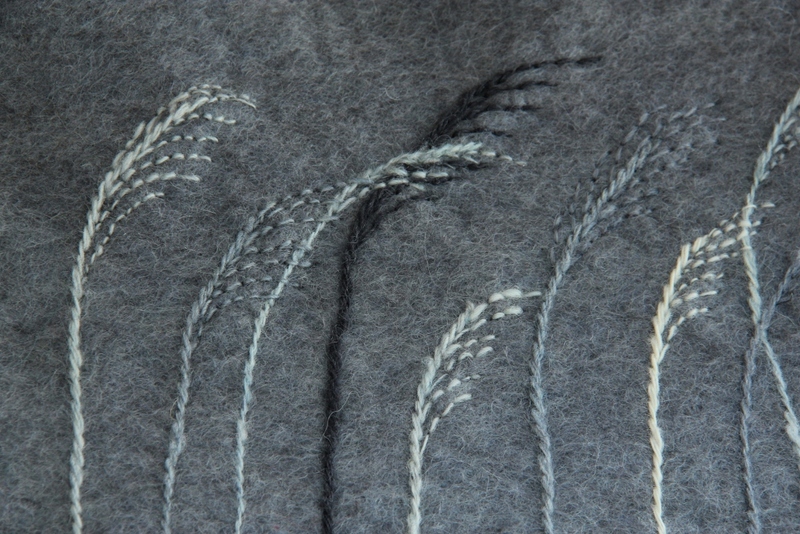 If you want to see the versatility of felting as an art form, have a look at Andrea Hunter’s website where you can see her beautiful landscape art, created entirely by felting. 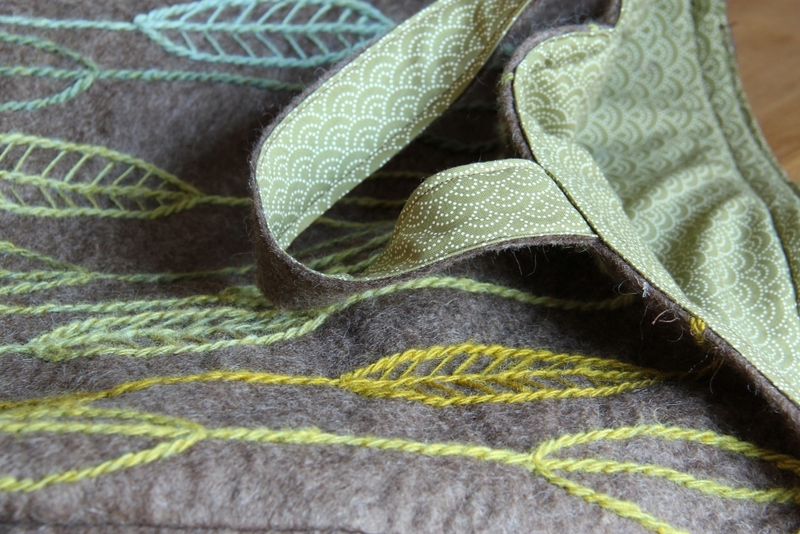 Categories: Bags, Cushions, Felting | Tags: felted bags, felted cushions, how to felt, Learning to felt | Permalink. It was a mother’s day in Finland a few weeks ago, and this year I made my mum a shopping bag. 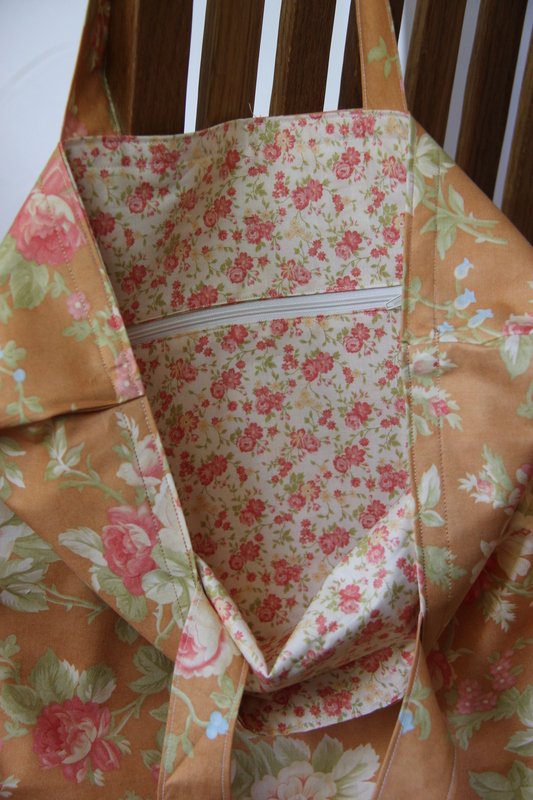 She likes romantic and pretty fabrics, so I have a special “Mum” section in my fabric stash, containing a nice selection of traditional English floral fabrics. These ones are from Breakfast at Tiffany’s by Moda which I bought from Quilt Home. I made her a shopping bag a few years ago, a very simple one with a single layer of fabric. While it was a handy and relatively light bag that fits into a handbag, it did not have any pockets. 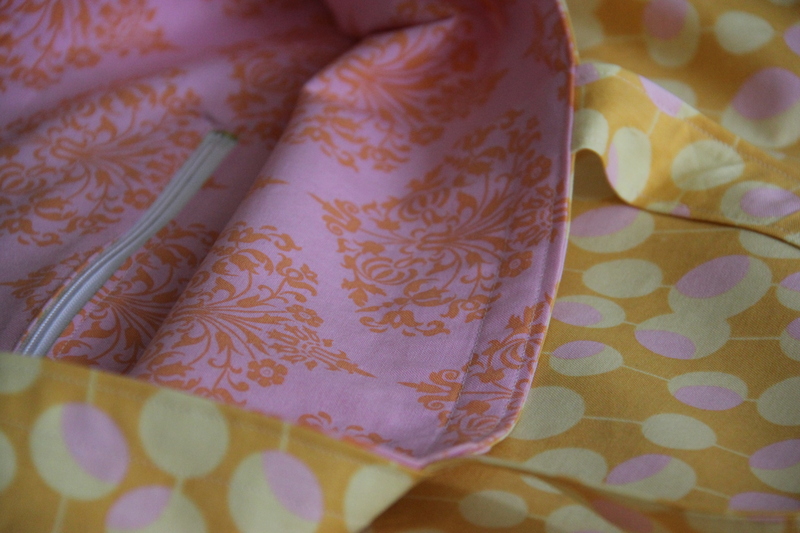 Recently she made a special request to have a shopping bag with an internal pocket for a purse and keys. 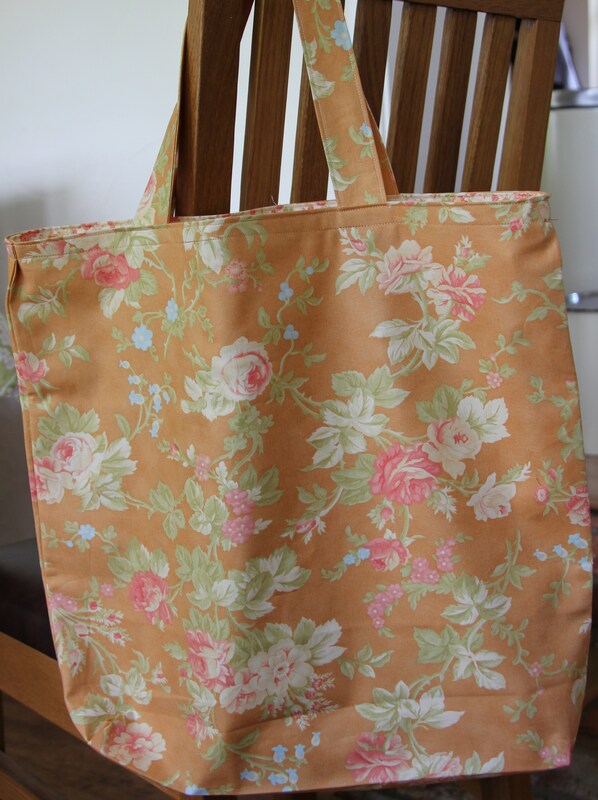 So this is the new version of my shopping bag, this time with a lining and an interior pocket (a first time I have done that so I was very proud of myself). Now that I know the technique, I am thinking of making another one for myself. This time I am thinking of taking some photos from the process itself so that I can make a tutorial out of it. I haven’t made any tutorials yet for this blog so it’ll be a good learning process for me. 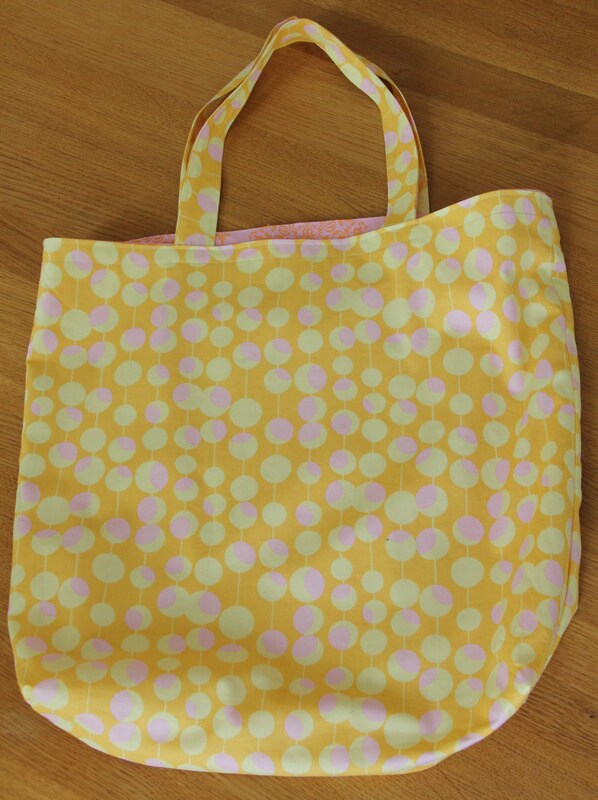 Categories: Bags | Tags: making a shopping bag, sewing | Permalink.